(Kale) Kale is a mild tasting member of the cabbage family, but does have a somewhat bitter taste when eaten raw or in green smoothies. The smaller, more tender leaves can be eaten raw in a mixed green salad. The larger tougher leaves are usually steamed and eaten as a side dish, or cooked in soups, casseroles, or stir-fries. 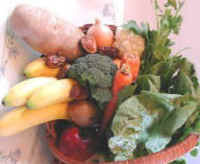 We also eat some of the tougher leaves raw in our vegetable "smoothies", which we make in our Vita-Mix. Like other cruciferous vegetables, kale has been shown to help protect against cancer, particularly for those on a vegan diet. Kale has also been shown to help protect against macular degeneration, an eye disease. Select kale which is firm and has dark green leaves. 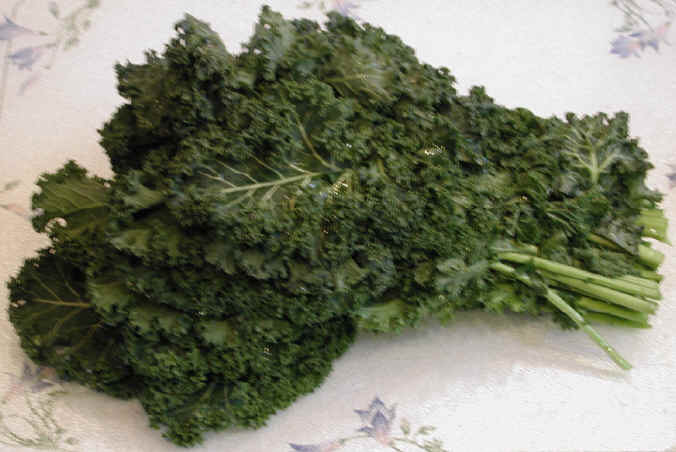 See the nutritional chart below for raw and cooked kale.